Sache, who are based in the Midlands also showcased a collection at the Birmingham Asiana Bridal show which took place a few weeks ago. They started the show with 4 partywear looks before moving on to bridal lehngas with matching menswear. I really liked these four churidar pajama outfits, especially the first one. I think they all look really flattering, from the colour combinations, to the fabric choices and the embroidery. Also liking the styling with the big circular hair pieces which featured all throughout this part of the show! How gorgeous is this shade of blue/green? I really loved the whole collection by Sache, the styles of the outfits aren't exactly revolutionary but I think the colours they chose definitely made these outfits stand out from all the usual lehnga and pajama suits you see everywhere. Has anyone shopped at Sache before? They don't seem to have much of a web/online presence and I'm interested to know what their prices are like! Sache, located on Alum Rock road, is what i consider to be a highly priced shop for the content it sells. The guy who owns is very difficult to bargain with, and his prices are very highly priced. Some of the stuff isn't necessarily unique in terms of design, but i have to say that what his USP is his ability to provide a range of colours in one design, and if its not in the shop, then you can get it made for you according to the colours and designs you want. 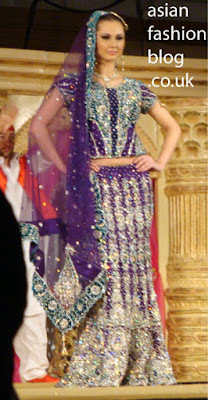 I think I prefer the Anarkali suits to the wedding lenghas in terms of originality of colour and design. I can't WAIT to get my hands on a couple of these next time I'm in the UK. I agree with Anonymous, i went in and tried a few ready wear sarees and really liked one that had alot of diamontes on it, priced at £295 he wouldnt budge on the price, i bought it anyway because i liked it, it was quickly packed and when i got home i noticed that there was 5 missing diamonte stones on saree and the sewing was untidy on the back of the blouse, missing hooks a hole in the blouse. I now know why, they told me it was a one off piece and i noticed it modelled in the asian mag, thats why it was like a seconds saree, because it had been worn before!! Do check the item quality closely before buying at a high price from this retailer. If i had noticed faults in the shop i would have demanded a discount. lame they price according to the person's budget - generally they all rip you off. i went to this shop the owner messed up my maxi.refused to give a refund told me i was being silly and that hes the designer he should know. he is the rudest man ive ever met. no one has spoken to me in that manner before i will never be going there again and il make sure others here about my experience and what an obnoxious individual he is. when you ring to chase it up the staff are rude and useless so he must have trained them it seems. he was screaming at me infront of other customers and refused to believe there was a fault with my maxi. i still havent got it i refuse to pay the rest of the money for such a pooly made item. I have been to the store ad must say they do have some nice pieces but nothing extraordinary or original..I went to the store to buy a dress for my daughter for her wedding and witnessed totally outrageous and unacceptable customer service..both the shop owner and staff were shouting at a girl who was unhappy with her order as it was poorly made and ill fitting, it actually looked like a reject item. (I say this as I saw the outfit myself). Needless to say I walked out of the store and as I did, the owner stated he did not need my custom or anyone else's who did not appreciate his designs. I am amazed someone would run a business in this manner. Actually my experience was the opposite to the above. Before placing the order the owner was very honest and clearly stated that the clothes will arrive baggy so that they can be altered when they arrive, second point the design on the material may vary slightly. They actually double checked my measurements as they didn't believe i was that skinny. Fortunately for me the clothes came out v good and exactly as seen in store. I prefer my clothes loose so that was no problem.My sisters clothes were slightly loose but they altered it within an hour on a a busy day Saturday. All staff have been trained to sew clothes most can speak Urdu and Bengali flluently. No desperate pushy sales. The quality is good. If the shop owner is verbally warning you prior to ordering there may be variations in tone or fabric design then that is acceptable. The shop can get rather busy at times. My experience at this shop was very good compared to another shop nearby. Please not I don't think any asian shop is prepared to give refunds. i have purchased many outfits from this store and have always been satisfied with my order. an honest reasonable owner. i managed to order my outfit and recieve it within 3 weeks as promised for no added cost and managed to knock off some too. I do agree with pps that the suits in that shop and others on alum rock road are ridiculously over priced, i dont think i could or would buy from there. But one comment i have to make be it off topic, is their honesty. We accidentally dropped an item of gold jewellery and went back a few days later and the man possibly the owner returned it, though the female workers rather reluctant to do so! So i have to commend him on his honesty in this instance. Suits are too overpriced...the women in the shop are very rude as they started arguing with my sister...and when we ordered made to measure clithes, they were either too big or too tight! I have been buying my suits for the past 7 years from sache I have never had any problem I've exchanged suits after buying lovely customer service always go to sache before I go anywhere else. Owner is well mannered and treats customers with respect. But I suppose when some customers get to much you have to deal with them somehow. Prices are same everywhere I have a wedding in march bought several outfits for my self and my son. I give sache a 5***** rating. I wouldn't even rate sache!! I think Its the worst shop I've ever been to and a lot of people I've spoken to agree. Customer service skills are lost on the owner. He has no respect and doesn't know how to talk to people. I don't think anyone should be spoken to rudely regardless of how their being only in extreme circumstances it might be condoned. don't own or work in a shop if you don't know basic communication skills. I've been there a few times and heard him speak to his customers in a harsh manner which is uncalled for. I ordered a dress from there and I understand there might be slight variations but he had almost made me a different dress to the one I originally ordered! and refused to refund the money! I think that's appalling! I would defo not reccomend this Shop. The owner is very nice at first very polite, however as soon as the order is placed its is a total different story. He is rude, aggressive and has no respect for his customers. The clothes in his shop are not unique and are soo over priced. I will defo not be shopping here again!!! Agree with the above, it's a different story once you've parted with the cash! I don't understand why people accept this sort of behaviour off asian people. I mean if this was to happen in a high street shop people would go crazy and as far as refunds go if he doesn't offer a refund just ring trading standards and if all the people who had bad experiences rang them then I'm sure something would be done about it.